There are many situations in which several single objects are better considered as components of a multi-component shape (e.g. a shoal of fish), but there are also situations in which a single object is better segmented into natural components and considered as a multi-component shape (e.g. decomposition of cellular materials onto the corresponding cells). Interestingly, not much research has been done on multi-component shapes. Very recently, the orientation and anisotropy problems were considered and some solutions have been offered. Both problems have straightforward applications in different areas of research which are based on a use of image based technologies, from medicine to astrophysics.The object orientation problem is a recurrent problem in image processing and computer vision. It is usually an initial step or a part of data pre-processing, implying that an unsuitable solution could lead to a large cumulative error at the end of the vision system’s pipeline. An enormous amount of work has been done to develop different methods for a spectrum of applications. We review the new idea for the orientation of multi-component shapes, and also its relation to some of the methods for determining the orientation of single-component shapes. 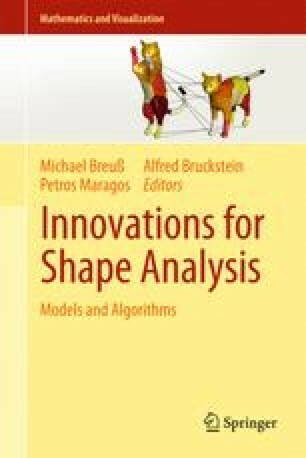 We also show how the anisotropy measure of multi-component shapes, as a quantity which indicates how consistently the shape components are oriented, can be obtained as a by-product of the approach used.